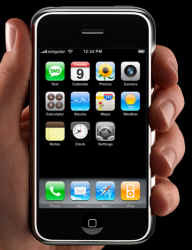 The Apple iPhone has been a tremendous success in revitalizing the smartphone concept. The iPhone combines phone, PDA, and Web usage -- with the full iPod player experience (syncing content with iTunes), mobile phone, plus Wi-Fi wireless networking. While dedicated devices like the Palm Treo are focused on hard-core organizer functionality -- large contact lists, fast e-mail access, one-handed operation -- the iPhone provides a much more integrated and pleasing experience. Even in its first release, the iPhone (and its companion iPod touch without the phone features) will make a very satisfying holiday acquisition, with the promise of future upgrades for hard-core organizer needs. What really makes the iPhone special, however, is the delight you feel in using it. You can read plenty of rave reviews (and unbelievers) online, but the real test is when even techno-agnostic spouses (the kind that aren't so enthused by each new electronic gadget) actually enjoy using it -- happily browsing the Web and viewing and shooting photos as soon as they first get their hands on it. Adobe has released the new version of Adobe Audition 3, its flagship stand-alone tool for professional audio production -- recording, mixing, editing, and mastering. Adobe replaced Audition in the Adobe Creative Suite 3 collection last year with the new Adobe Soundbooth, which provided task-based tools for everyday audio editing and cleanup, sound design, and music creation. Meanwhile, Audition continued as an independent high-end audio editing tool, designed for professionals including sound designers, recording and mastering engineers, and musicians. - Quicker and more powerful editing with direct on-clip drag-and-drop editing. And the amazing Frequency space / Spectral editing view now supports the Photoshop-like Effects Paintbrush and Spot Healing Brush. - New effects and tools including Convolution Reverb, Analog Delay, Mastering tool, and Tube-modeled Compressor, along with iZotope time stretching. Plus improved noise reduction and phase correction tools. - MIDI support, with a piano roll editor for recording and mixing MIDI tracks, using industry-standard VSTi virtual instruments. Bottom line: While Audition 3 is not a huge re-write or re-design of the product, it provides a broad range of significant enhancements that make it well worth the upgrade -- for more powerful tools, time-saving editing, and enhanced performance. I'm here in Las Vegas for CES 2008 -- the annual Consumer Electronics Show. CES is just huge -- it opened this week with some 140,000 people checking out 2,900 exhibitors, 200 conference sessions, and a profusion of associated activities throughout Vegas. I'll leave the instant live blogging to the teams from Engadget and Gizmodo -- with visual booth tours and hands-on product reports. These blogs have deployed with military planning, including some ten bloggers, logistical traffic managers to coordinate assignments, and standees to make sure their reps were at the front of each line and in place for each press conference. You can visit the conference virtually -- many of the official keynotes and talks also are posted on the CES Multimedia site, along with photos. CES has grown this year to add content companies to its roster, with exhibits from Sony Pictures and NBC Universal -- so also you can catch segments from the conference on the Today Show, NBC Nightly News, Access Hollywood, and other properties. For more on CES 2008, see my full CES 2008 Summary article -- with information on the conference and more links to resources. Each year the major CE companies seek to upstage each other at CES by unveiling even larger flat-panel television displays, and this year saw a humongous 150-inch plasma display from Panasonic. The new TV lines are focusing on design, with thinner and more fashionable flat panel sets. TVs now can display overlaid windows with Web-like gadgets, showing news, weather, sports, and even general RSS feeds. Connectivity is another big trend, as devices are building in connections -- Wi-Fi and Bluetooth, wired and wireless, home network and Internet. We're getting closer to finding a consumer-friendly answer for home media storage and sharing, from disk servers to set-top boxes. And there are plenty of me-too products following trends that consumers snapped up as holiday gifts, including portable media players, digital picture frames, headphones, and other accessories. But there's still lots more here to talk about, once things settle down and these great demoed products actually ship for some real hands-on testing. The party's over -- CES 2008 is over. I've updated my CES 2008 Summary article with links to a variety of wrap-up articles and posts, including top 10 lists, best-of awards, and more video essays and photo updates from the event. The Aliph Jawbone noise-canceling bluetooth headset was introduced with a splash last year at CES, and has garnered lots of fans for its noise-reduction technology (see previous post). 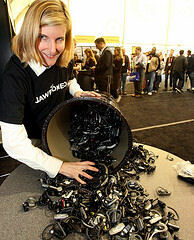 But Aliph returned this year with an even better blast -- the company set up a booth in the CES Concierge Center tent in front of the Convention Center and offered a free trade-in deal -- just turn in your old headset, and exchange it for a new Jawbone (street price $89). See the results in the coverage at BoingBong and other blogs, and in the Aliph Flickr photo gallery. 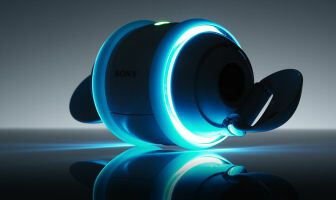 The Sony Rolly is an egg-shaped music player with lights and wheels that dances to the music, and is futher animated by pop-out ends (press release). In the annual bragging rights competition for biggest flat-panel display, the prototype Panasonic 150-inch plasma display towered over the South Hall, as a substantial jump from its current 103-inch model (press release). The prototype's screen size has an effective viewing area of 11 x 6 1/4 feet (3.31 x 1.87 m), and is equivalent to nine 50-inch displays. Its resolution is 8.84 million pixels (2,160 x 4,096) -- more than four times the full 1080p HD specification (1,080 x 1,920). But even more than screen size, the focus this year was on thinner displays, with Panasonic, for example, demonstrating a prototype 50-inch plasma display that is 24.7 mm (less than one inch) thin (about one-fourth as thin as previous plasma TVs). It weighs only 22 kg (about half the weight of previous models). Whether you already are working with music and audio, or are interested in getting creative and learning more, the Sony Music Studio and Sony Audio Studio software products from Sony Creative Software are a great way to get started. These Windows applications are $59 each (download) or $69 (packaged). Sony ACID Music Studio 7 is for creating music, with music recording, multi-track mixing, loop-based soundtrack creation, and MIDI processing. If this sounds daunting, you can start out with the sample mixes and experiment with the more than 3,000 professionally recorded loops to build up your own custom mixes. Or customize simple MIDI tunes such as ring tones on your mobile phone, and then explore the included 1,000 MIDI files in a variety of genres. Sony Sound Forge Audio Studio 9 is focused on end-to-end audio editing -- recording, editing / restoration, encoding, and mastering. 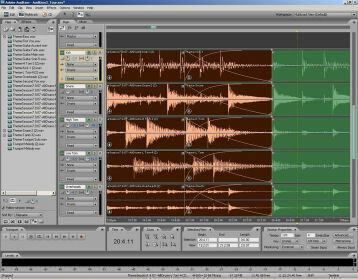 Again, you don't have to be an expert to get started working with audio clips. Explore the 1001 Sound FX library to customize sound effects for your productions. Or import tape or vinyl recordings, or audio tracks from video shoots, to clean up and enhance the sound. Sony Creative Software develops these consumer tools in its Studio line, plus higher-end professional tools for digital video, music, DVD, and audio production.. 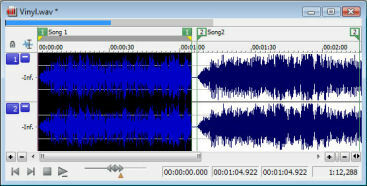 The product lines are built around three core product names: Vegas for video editing, Sound Forge for audio editing, and ACID for music creation. See the Sony website for documentation and downloads of trial versions you can check out. "MP3 players" are growing into "portable media players" -- with products like the Apple iPod nano growing larger screens for showing photos and playing video. But what's the minimum you need for a basic MP3 music player? As the iPod shuffle has shown, you don't even need a display on a music player -- you can just shuffle randomly or play through a playlist. The minimum requirements for a simple MP3 player, then, are two controls -- one for volume, and one for next/back. So here's an iconic design that satisfies these constraints, the iriver Mplayer -- a 1 GB music player in a tiny Mickey Mouse head. It's ridiculously small and light -- 1.7 inches from ear to ear, and 0.6 ounces. And the Mplayer is trivial to use -- just twist one ear to adjust the volume, and the other ear to skip forward or back within or between tracks. Just plug in to the headphone jack between the ears, and power up and transfer files using the mini-USB port on the bottom (it plays for about 9 hours on a charge). There's also a power button on the side, and a small light for status. Unfortunately, while the Mplayer is a top seller in Korea, launch dates in the U.S. are still tentative. 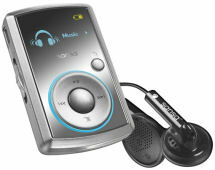 See my Portable Media Players Gallery for details and comparisons. Too much, too fast! This year's annual Consumer Electronics Show in Las Vegas saw some 20,000 new products introduced from the more then 2,700 exhibiting companies. It's a wonderful, but confusing, world at the electronics store -- for consumers as well as manufacturers. What is the industry to do? -- There's so much new technology to leverage, so many possible features to add, and so much potential in integrating multiple devices. But you can't ask customers what they want, because the new devices have not been invented yet. So instead we see a profusion of different combinations of features, form factors, and price points thrown into the market to see what sticks. - Connected home: Purchased content is becoming less encumbered, with DRM-free MP3 downloads and managed transfers within the connected home. But do you want TV on your PC, and/or PC features on your TV -- with RSS feeds in pop-up windows? And who will control the box that bridges the two worlds, the cable company or Apple TV? 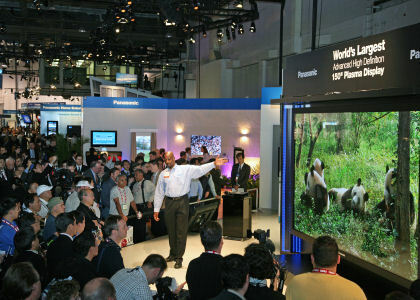 - Digital TV: Flat-screen TVs are hot with consumers, and have finally reached "Full HD" resolution. But there's still major improvements coming in size, design, picture quality, and connectivity -- as well as the new OLED displays. Or is the future actually in mobile TV on smaller screens? - Mobile media: Portable media players add video and connectivity, while mobile phones add media and Internet playback, both overlapping further with features including Internet radio, streaming video, and Web access. And both do GPS, while GPS navigators add media and hands-free phone. Now you can watch TV while reading the live map, and talking on the phone. - Cameras: The picture phone is becoming the dominant imaging device. But still cameras shoot better photos plus reasonable video, and video camcorders shoot HD video and great stills. We'll all be recording and recorded, especially as today's memory-based HD camcorders shrink to the size of a soda can. - Portable storage: Storage outstrips Moore's Law, with continued re-doubling of capacity and shrinking size, with solid-state drives (SSD) starting to make sense for laptops. Yet sneakernet still lives, both for sharing, and for moving content within the home. - Wireless: There's Wi-Fi and WiMAX to the home and neighborhood, wireless mobile Internet to the PC, wireless HD video to the TV, wireless USB to devices, and even wireless power for recharging. Or you can just network over the existing power line. Or a simple approach like Bluetooth can continue to develop to really enable computers, players, phones, and headsets to share phone calls, stereo music, and controls through the air. 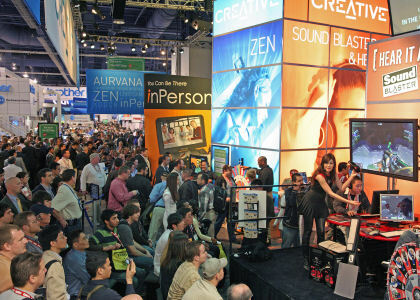 I've updated my CES 2008 Summary article with links to a variety of wrap-up articles and commentary, including top 10 lists, best-of awards, and more video essays and photo updates from the event. If you like the idea of a tiny music player that's easy to carry, then check out the SanDisk Sansa Clip. It's not quite as tiny as the Apple iPod shuffle (0.9 ounces vs. 0.55 ounces for the shuffle), but it adds a bright multi-line display so you can browse through your music. And, like with other non-Apple players, the Clip also adds a FM tuner with 40 preset channels, plus voice recording with a built-in microphone. It plays MP3, WMA (Wiondows Media Audio), secure WMA (purchased music with DRM), and Audible audio formats. The design includes a sliding Power button on one side that also serves as a hold switch, Volume control on the other side, and a Menu button and control pad on the front to access the nice SanDisk menus, complete with simple animation. Like the shuffle, the Clip also has a clip on the back -- but it is removable to make the player even smaller. The Clip nicely uses a standard mini-USB connector, so you don't have to carry a special Sansa cable. The internal rechargeable battery is rated to provide up to 15 hours of play time. The original Clip from the summer 2007 is available with 1 GB of storage for down to $29, and 2 GB for $59 (compared to the shuffle with 1 GB for $79). And SanDisk has announced a new 4 GB model for $79, due in February, in a "stylish" silver color (shown above) with a mirror finish on the front. That's enough storage for some 1,000 songs. For more music, plus videos, still in a light package, the flash-based SanDisk Sansa View video player will be adding a model with an amazing 32 GB of memory for $349. That's some 48 two-hour movies or 8,000 songs on a light player under 3 ounces. The View features a 2.4" screen on a 2.9 ounce player. The initial models have 8 GB for down to $129, and 16 GB for down to $169. Headphones are a great luxury when you travel -- They deliver better sound, provide over-ear coverage for sound isolation from your fellow passengers, and even can add active noise cancellation technology to reduce the hiss of air conditioning and roar of engines. But in today's world of cramped airlines and slogging though airports, even foldable headphones like the JVC HA-NC250 Noise Canceling Headphones (see previous post) just take up too much space in my carry-on. So it's time to break out the tiny earphones. Given their small size, you can't ask for too much sound perfection from earphones, especially because you'll likely be listening with them in noisy environments (streets, subway, airplanes) and on portable MP3 players with compressed music. What you do want, given reasonable sound, is a good fit (to block outside sound) while still being comfortable to wear for extended periods. Some people can't stand earbuds that insert in the ear (typically with replaceable earpieces), while others don't like the style that hooks over your outer ear (typically with replaceable nets). But for my travels, I want an in-ear bud to block outside sound, so the big issue is the comfort of the earpiece that's going to nestle up in there. JVC has a couple new interesting options in earphones, the higher-end JVC Bi-Metal Headphones (HA-FX300, $99) and the JVC Air-Cushion Headphones (HA-FX66, $29). The JVC HA-FX66 Air-Cushion Headphones are designed for a secure fit while remaining comfortable. 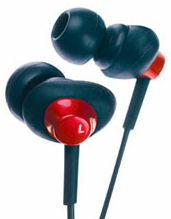 They have an angled earpiece that inserts in the ear, while the base nestles securely inside the outer ear. They're available in blue, black, red, and white, at a street price down to $20.85. JVC provides several options for getting a comfortable fit with both of these earphones -- you can try out three sizes of soft silicon rubber earpieces for a comfort fit, and one memory foam earpiece for a customized fit. And both have nice design features for the cord, with a sliding cord joiner to make it easy to wrap up, and a friction noise reduction cord that reduce noise from moving and rubbing the cord. The high-end JVC HA-FX300 Bi-Metal Headphones incorporate several new technologies for clearer sound, including an aluminum evaporation diaphragm (more accurate high-frequency detail), a Bi-METAL structure (reduces vibration and energy loss), an aluminum housing (reduces resonance) and an oxygen-free copper cord (minimizes transmission loss). They're available in black, red, and bronze for $99.95. 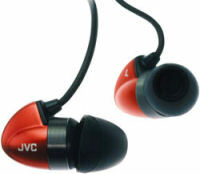 The bottom line on earphones is to find a style that's comfortable for you for extended wear, and that offers a range of earpiece options like these JVC designs. While more expensive designs can sound better, especially in quieter listening environments, you may find other features that make the deal for you. For me, for example, the Sennheiser CX 400 Ear Canal Headphones ($80, see previous post) have good sound and small and shallow ear canal adapters that nestle comfortably in my ear. Plus they have the bonus feature of a short cable that reduces dangling when I stash my media player in my shirt pocket (although it gets tight for hooking to the in-seat audio or to a computer, which is why they include a separate extender cable). And as a reminder: Please practice good hygiene if you share earbuds by cleaning off the accumulated ear wax (ick! ), and keep the volume down so you don't blow out your ears with the speakers that you've wedged in your ears (ouch!). Entries posted to Manifest Tech Blog in January 2008, listed from oldest to newest.